Wes Anderson is more one of the most distinctive directors working today, yet I consider him to be more of an artist in film than a director. The reason I say that is because with his camera he paints such extraordinary visuals on the frame that almost any still image could serve as a portrait worth hanging on a wall. This is an especially appropriate comparison since his newest film The Grand Budapest Hotel involves a priceless work of art as part of a wealthy dowager’s will being stolen and recovered. It opens up with a little girl at a cemetery where we see keys on a tombstone, similar to how you would find room keys hanging up behind the concierge’s desk at hotels years ago. The girl then opens a book entitled The Grand Budapest Hotel and we are off on our narrative journey. This is similar to the way Wes Anderson opened his film The Royal Tenenbaums as if it were based on a book with chapters when it was actually an original screenplay. 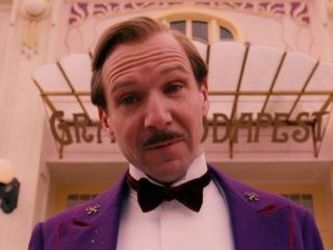 The story is about a hotel concierge M. Gustave played by Ralph Fiennes who is extremely dedicated to his job. He wants to ensure that all of his guests have a flawless stay at his hotel. In fact, he is so dedicated; he even befriends and romances the older, wealthier single women who stay at his hotel (however they must be blonde). The women do not mind as it provides them with some romance, attention and excitement in their lives. Gustave is clearly inspired by Max Bialystock from The Producers by Mel Brooks. Not only that but his bellboy is named Zero Moustafa, which I assumed was after Zero Mostel, the actor who played Max Bialystock in the 1968 film. 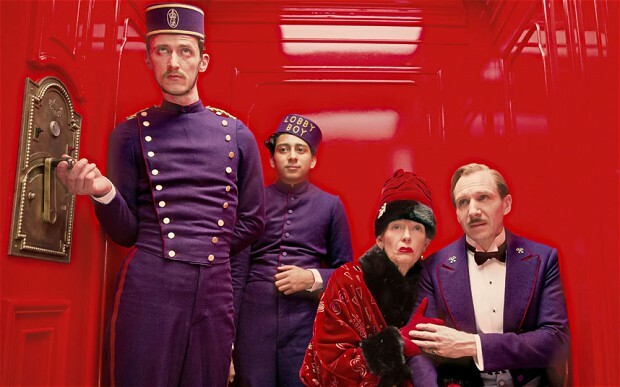 Our story is told through the eyes of the bellboy as an older man played by F. Murray Abraham, describing how he inherited the hotel to Jude Law. But actually that is just the story within the story of the book we saw at the beginning written by a character simply known as “Author” played by Tom Wilkinson. 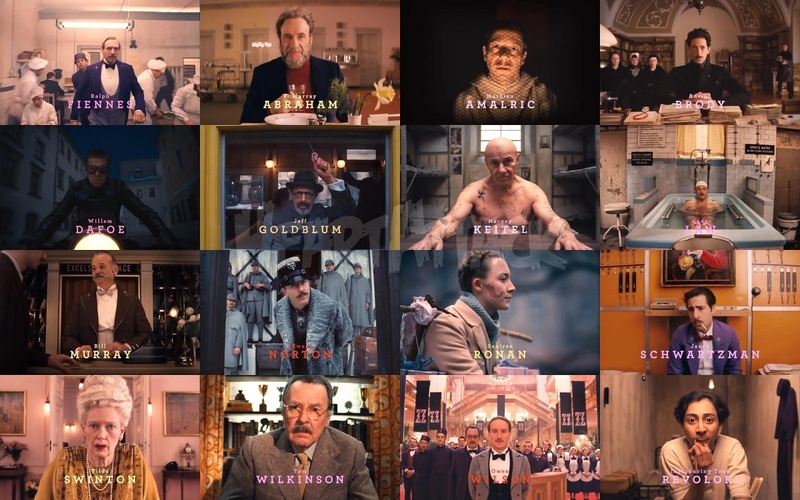 The movie is essentially a who’s who of Wes Anderson films, many of which have worked with Mr. Anderson on previous projects. 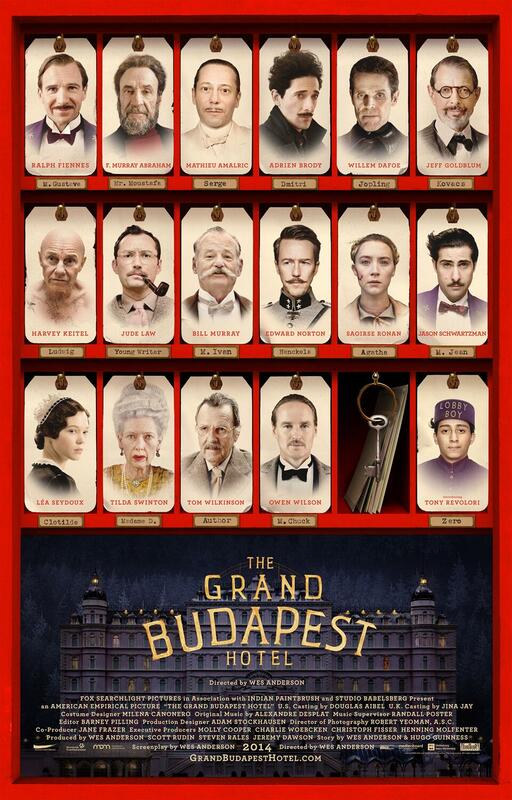 Tilda Swinton plays the wealthy octogenarian who passes away and alters her will to benefit Gustave. 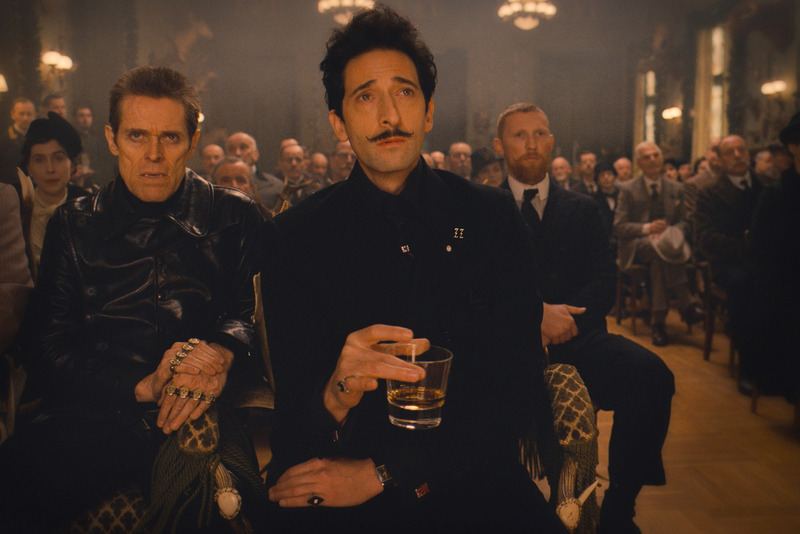 Adrien Brody is her son who is outraged by this and has Wilem Dafoe hunt down people trying to obtain the valuable painting that Gustave stole from her estate even though the deceased matriarch promised it to him. Jeff Goldblum is the lawyer who reads the will with all of its additions and amendments; Edward Norton plays the police inspector assigned to arrest Gustave, Harvey Keitel plays a tough inmate who befriends and later escapes with Gustave and of course Bill Murray is here as a fellow concierge who assists Gustave in his escape plan. This marks the seventh time Murray has worked with Wes Anderson going all the way back to his landmark performance in 1998’s Rushmore which really rejuvenated Murray’s career and set it on a path of dry art-house acclaim. All of the people mentioned in the previous paragraph are Wes Anderson alumni and all once again deliver what you expect them to as actors in a film from this auteur. In a film such as this, plot is always secondary to Wes Anderson. What comes first is the world he creates in his movies. This enables his pictures to have a sort of timeless quality that very few directors have to distinguish their work. 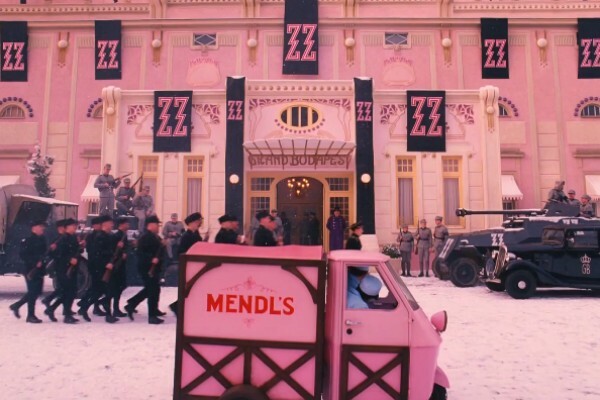 The Grand Budapest Hotel is no exception and it takes place in 1932 in a fictitious Z-named country on the “eastern most part of Europe” in the early days of what we assume will be World War II. Edward Norton and his police are never called Nazis and their uniforms are different but the idea is obvious. Stylitsically, Anderson even plays around with the aspect ratio of the film and during the majority of the movie where the story takes place in 1932, we see it in full frame and not the usual widescreen presentation. 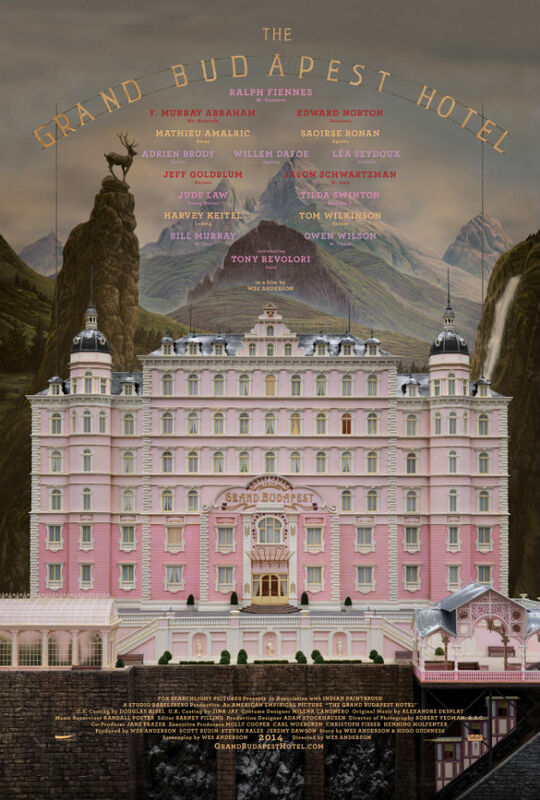 Even though Grand Budapest masterfully creates a new world which the audience has never seen since it comes directly from the imagination of Mr. Anderson, it is not a world I felt I would want to get lost in unlike the Island of Penzance from Moonrise Kingdom or even the building where the Tenenbaum family resided in The Royal Tenenbaums. Those were worlds Anderson created that I wanted to spend even more time in. 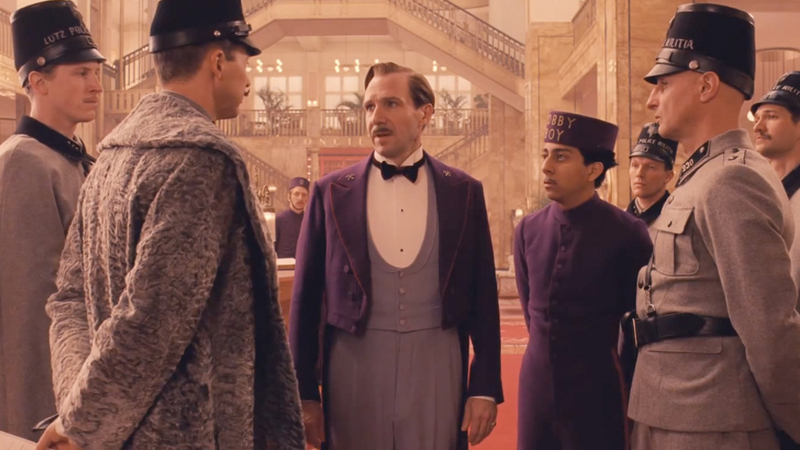 At a running time of 100 minutes, my stay at The Grand Budapest Hotel felt just right, any longer and I’d have wanted to check out sooner. This movie felt more like a greatest hits compilation of actors and comedy styling’s that Anderson has used in his previous features than a great original work. His artistic expertise is on display as masterfully as it has ever been and his keen eye for creating a world down to the smallest detail is as sharp as it always is. Unfortunately his directorial prowess seems a little bit lost at times. Grand Budapest is dark, but even with its frenzied comedic violence; it is not nearly as dark as the superior Rushmore. Anderson’s new movie has a lot of heart to it, but not even close to the emotional heartfelt moments that made Moonrise Kingdom so wonderful. 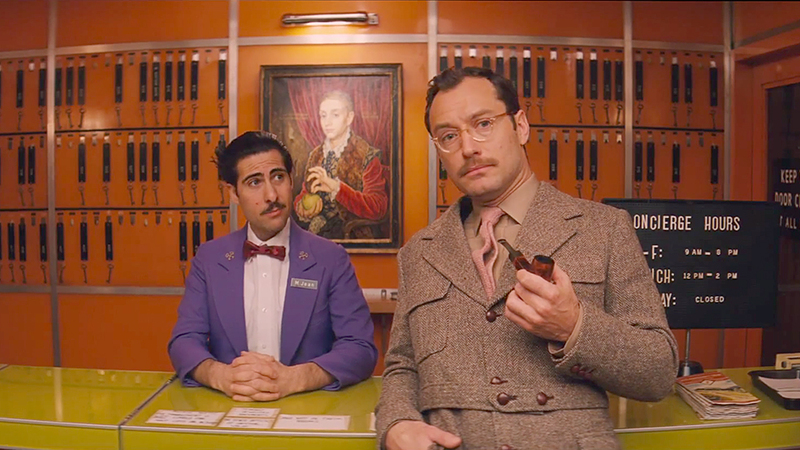 In the end, we are left with a good Wes Anderson movie, not one of his great entries. It is still worth seeing but will probably not make it onto many best of the year lists next winter. 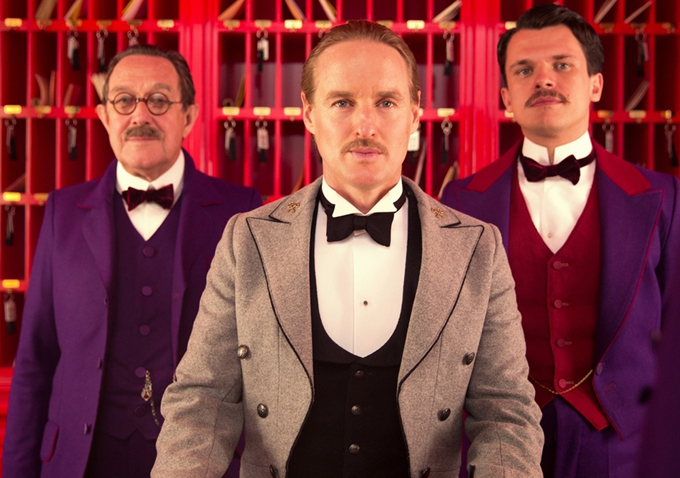 In the meantime, since March is usually the doldrums for going to the cinema, The Grand Budapest Hotel is the perfect artistic, dark, funny and intelligent alternative to probably 90% of the movies playing at your local multiplex. Check out this hilarious bit from SNL. If Wes Anderson ever makes a horror movie, I hope it looks a lot like that.